It has been a while since I have posted on this blog. I have been spending most of my creative time actually creating around 150 new pages that I hope to show on here over the next few months. This spread is of our flight from Chicago to California and back. the next few pages will show what happened in California in between the two flights! For this spread I used photographs from the two flights as well as the ticket stubs and baggage tags. 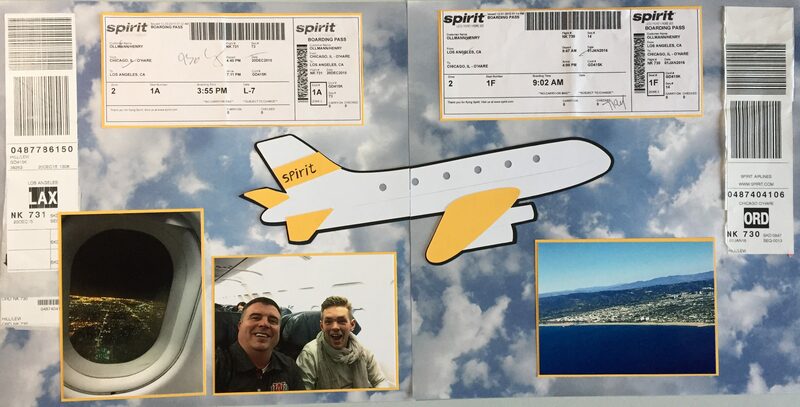 We flew on Spirit Airlines, whose color is yellow, so I made the paper airplane cutout on my cricut and chose yellow accents to emphasize the airline colors. The photographs are also bordered in yellow. I love using this cloud background paper for airline or flight spreads as it helps the page to fell airy and light. I like to use ephemera such as the tickets in my scrapbooking because it is a subtle way to show the dates that things happened.